Recommended intake: Stir 40 g (1 measuring spoon) in 400 ml of water and drink approx. 45 minutes before your stamina training. On non-training days, take one servinge in the morning after getting up or one at nighttime before going to bed. The recommended daily dosage must not be exceeded. This sports beverage is rich in carbohydrates and convinces with its new formula and outstanding ingredients. The innovative Carbo-T4-Formula® is made up of different carbohydrates such as isomaltulose, ultra high moecular corn starch, D-glucose monohydrate and maltobiose. 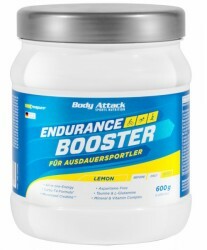 This makes Body Attack Endurance Booster different from many other carbohydrate drinks which only contain short-chain and fast-absorbing carbohydrates like maltodextrin and dextrose. Furthermore, one serving of Body Attack Endurance Booster contains 3600mg of the amino acid L-arginine, 1500mg of L-glutamine, 1500mg of taurine, 100mg R-alpha-lipoic acid as well as 100mg of D-pinitol. Unlike ordinary creatine monohydrate (which the former Cell Reloader was mixed with), the Body Attack Endurance Booster now contains high-quality Creapure®. The creatine of Creapure is contained in a quantity sufficient to enhance bodily performance during springiness training (speed). 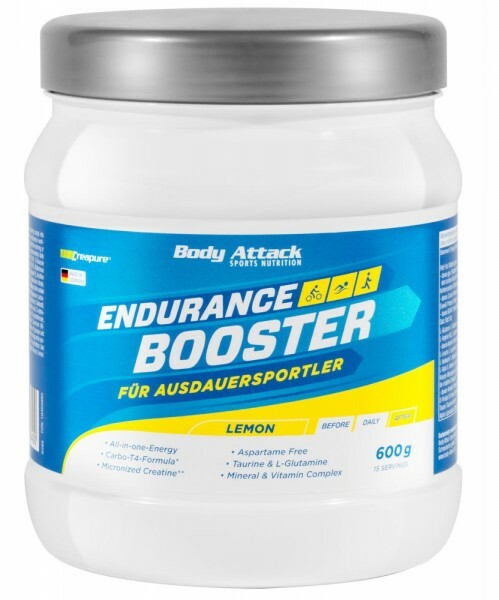 The Body Attack Endurance Booster does not contain aspartame but added natural fruit concentrate (lemon and orange juice concentrate) instead. Furthermore, this powder dissolves better in water.